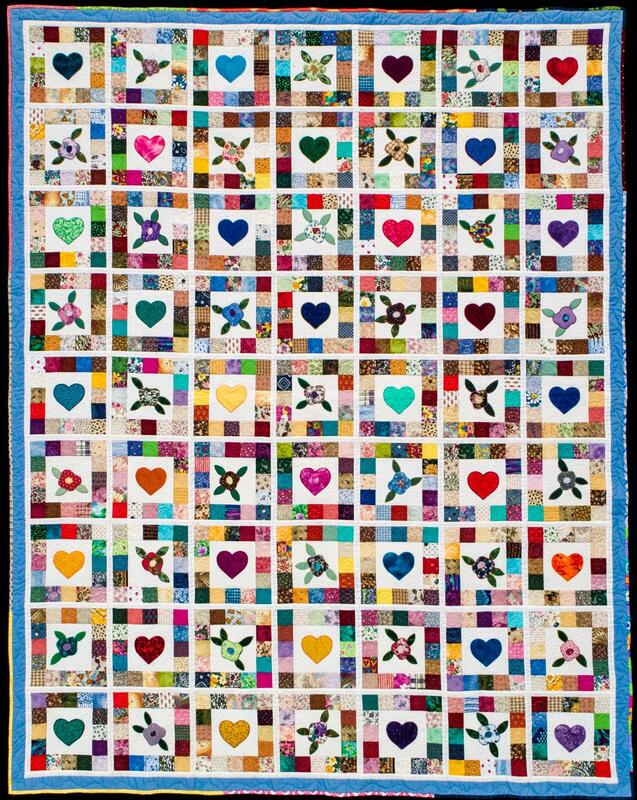 2018-19 Opportunity Quilt "Hearts and Flowers"
The Gold Bug Quilters Guild of El Dorado County represents quilters of all ages and interests in the art of quilting and fabric art. We believe that the best way to contribute to the growth and knowledge of quilting is through education and fellowship. We hold meetings each month at which time we share techniques, designs, and projects (complete or not). The Gold Bug Quilters also use their talents for community service projects such as creating comfort quilts that are donated to such organizations as the Senior Center, Child Protective Services and Family Connections, Foster Families Service and Foster Families and Infant Development Center. Gold Bug Quilters was started in July of 1987 with 12 members. The name was chosen to represent our Gold Rush heritage. We encourage visitors to join us at one of our meetings for an experience in the world of Quilting Arts. Our meetings are held the 4th Wednesday of the month at the American Legion Hall 4561 Greenstone Road, Placerville, California 95667. The doors open at 6:30pm and the meeting starts at 7:00pm. The meeting is open to members and visitors. The program consists of a brief information time, a special program, refreshments, "show and tell", and drawings for "pot of gold", birthdays, fabric basket, and "block of the month". There is a fee of $4.00 per meeting for non-guild members. If you like to shop we have a boutique, silent auction items, raffle baskets, vendors, and our opportunity quilt. Funds raised from the Opportunity quilt sales are used to support scholarships to local high school students. There will be many beautiful quilts, wearables, and home decor items on display and yummy food. $7.00 admission includes all 3 days. Children under 12 are free. Hope to see you there. Check out the photo page to see the Viewer's Choice Winners and some of the beautiful quilts that were shown at past years shows. Check out the Monthly Program Page for the exciting special speakers we have scheduled for the next few months. Snuggle Quilt Workshops are 10 am to 3 pm at the Foothills United Methodist Church at 3301 Green Valley Road, Rescue, CA. Check the Calendar for the next scheduled workshop or Contact the guild at goldbugquilters@gmail.com. Visit our Photo Gallery for a snapshot of Gold Bug Quilt Guild Events, including the 2018 Quilt Show highlights and the Quilter's Day Camp Retreat.